Two tickets, Senators vs. Carolina, Sunday, Nov. 27, Section 105 Row G, seats 3 and 4. 5:00 game time. (Includes parking voucher for lot 1.) Total Value: $250. * Holiday Hockey: 2 Sens game tickets, section 105, Row G, seats 3 and 4. Devils vs. Senators Jan. 2, 2012. Value $120 ea. Parking pass for Lot 1, Scotiabank Place. Value 17. Copy of book "Roger's World: The Life and Unusual Times of Roger Neilson," bio of former Senators coach Roger Neilson. Forword by Scotty Bowman. Autographed by author Wayne Scanlan. Value $35. for a Total value: $292. Ottawa Citizen- Music columnist BID Now! The Ottawa Citizen Homes Editor BID Now! 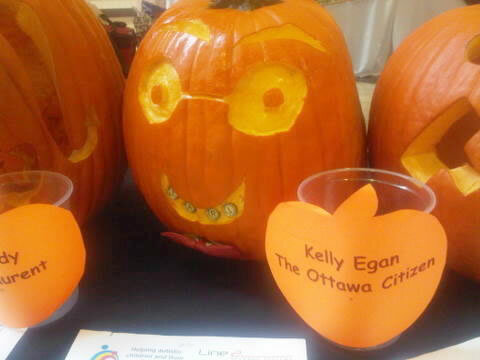 Ottawa Citizen- Social columnist BID Now! -NAC Family Tickets (4) "A-BACH-cadabra" Sat. Oct.29th 1:30 p.m., Orchl Row W, Seats 17, 19, 21, 23, Mary Kay pack - Satin Hands & Necklace" 30" bronze faux pearl bead. Total value: $120. Prize package includes: Mega Blocks Set (ages 1-5); Heavy plush Green Butterfly Costume - Great for outdoor treat'n'treating - Age 3-5 years; Black Fleece Hats & Mitts Set; Halloween key chain. Total value: $55. 14 vouchers for Ottawa 67s tickets to a regular season Ottawa 67's game. Expires March 16, 2012 Total value: $280. 12 vouchers for Ottawa 67s game tickets. Total value: $240. "The right wing prize pack extravaganza" which includes. A collection of Sun News Network paraphernalia. An autographed copy of Lowell Green's latest book. A signed copy of Ezra Levant's Ethical Oil taken direct from the set of his Sun News show The Source. Ben Shapiro's best seller Prime Time Propaganda. And a Mark Steyn grab back including a Viva Steyn T-Shirt, a scary conservative shopping bag, Mark's latest best seller After America and his hit Christmas CD featuring Marshmallow World. Total value: $225. 4 – Ottawa 67’s VS. Mississauga Majors, Friday, October 28, 7:30 pm Section 16, Row D, Seats 1-4 Value $76; 2 – 369g cans of coffee value$13.98 + 2 – 454g. Cappuccino $13.98 + 1 – 500g. Hot Chocolate $4.69; 1 – 10 Cup Tim Horton's Coffee Maker $129.95; 1 Tim Horton's Stress Ball; 1 Tim Horton’s fleece throw + $25 Tim Horton's Gift card & 1 Rogers bag Total value: $525. 1. CTV News memorabilia, Frisbee, coffee mug, pens, chocolate, iStickyPAD, flying disc, black women's medium Coal Harbour shirt, extra large red Coal Harbour shirt, two pens. Approximate value $50. 2. MiJam mixer. Approximate total value $100. 4 The Bear Halloween Howler Tickets & Two Black 106.9 T-Shirts (Mens XL, Womens Medium). Total value: $100. Movie pass for two to Tower Heist, Empire 7 Cinemas , 111 Albert Street, 3rd floor. Wednesday, November 2, 2011 at 7:00pm & 2 Boom mugs Four 67 hockey tickets. Total value: $110. Voucher for National Arts Centre for two to attend one of the National Arts Centre Orchestra, English Theatre, French Threatre or Dance presentations between October 24th, 2011 to September 30th, 2012. Some restrictions and exclusions apply. Excludes Handels Messiah, Christmas with the Orchestra, Gala performances, Special Concerts, Marinsky and Nutcracker. & 3 x Autographed by the band Trooper CD's, wicked Grin CD and a Crown Royal Visor. Total value: $150. Saunders Farm HAUNTING Season Family Fun Pass (2 Adults, 2 Children). Total value: $65. 2 Regular price admissions on any tour offered by Haunted Walks Inc.in Ottawa or Kingston (not valid for special Halloween tours from Oct 14-31, 2011). 3 DVDs: The Final Destination in 3D, Whiteout and Trick 'r Treat Total value: $75. Scheilch Figurines:- Oracle and 6 boxed Elfen Figurines Total value: $120. 6 CDs: Now 16, Much Dance 80s, Madonna - Celebration, Tiffany - I think We're Alone Now 80s hits, Michael Damian - Rock On, Pure 80s No. 1's. Total value: $75. 2 tickets, Ottawa Senators versus Toronto Maple Leafs, Sunday, October 30, 2011 at 7:30 p.m. Section 326, Row H, Seats 19 and 20. Approximate value $150. $50 Esso Gift Card Total value: $ 200. The highest bidder will receive an autographed copy of Lowell Green’s newest book: "Here's proof only we conservatives have our heads screwed on straight". Total value: $30. The highest bidder will receive a gift basket from Farm Boy in the Merivale Mall valued at $100. The Count GoneWrong Prize Pkg: -two passes to Haunting Season at Saunders Farm #0731 & #0732 expires 2011. Four tickets to see the Ottawa 67s on Oct. 28, Section 19, Row HH, Seats 5, 6, 7 & 8; 2 x $25 gift certificates to Lago Restaurant, 1001 Queen Elizabeth Drive, expires Nov 30, 2011 & $25 gift certificate to Hooley’s Pub, 292 Elgin St. Total value: $195. 2 x CHEZ 106 Hats; 2 x CHEZ 106 T shirts ; 2 x CHEZ 106 Lanyards ; 2 x Guest passes for The Works - One Gourmet Worksburger; Disney's Prince of Persia - Blue Ray; Transformers 3 DVD; Pizza Pizza Gift Card; Cineplex Gift Card ($30); CHEZ Bag; 2 x hockey tickets ($45 ea) for Ottawa Senators vs Florida Game, Oct 27, 7:30 pm, Sect. 322 Row E, Seats 7 & 8. Total value: $300. $25 Gift Certificate, Grace O Malleys, 1541 Merivale Road. Mary Kay travel size Sun Care Set. Total value: $50. Jill Alexander Acrylic Painting - The Solo . Loan Skater surrounded by Snowmen winter Scene. Total value: $150. Pack of 4 Ottawa 67's Vouchers for future games. Total value: $80. Lunch for 2 with Yasir Naqvi, MPP Ottawa-Centre. You have your choice of any restraurant in Ottawa Centre, or you can join Yasir in the Legislative Dining Room at Queen's Park. Total value: $50. Bucket bag, Tanning package, Tanning lotion, Laundry detergent, Chi flat iron with carrying case Total value: $300. $100 of Assorted Halloween decorations. Busters Bar & Grill T Shirt - size Small Adult & Busters Bar & Grill Baseball Cap - Adult size. Busters Bar & Grill $25 Gift Certificate - expires Dec 31 2011. Dog Items:-Paws Double Dog Dish; City Pets Spring Hat & Bandana for the dog – Medium; 2 x Ol'Roy Gormet meal sachets; Soft & Chewy Milk Bones; Mr Bone chew bar; Dog Collar .80"-x12"- 22"; Paws - Raw hide bone, braided rope tug toy, retractable dog leash; Pet wipes & Pet waste bag dispenser; Squeak toy plush & Brown blanket. Total value: $100. Dr Sunita Bhatia is donating a professional teeth whitening service along with the goodies inside her pumpkin (DVD,crayons,puzzle,chips). Approximate Total value: $425. Pink Princess Pumpkin & 2 tickets each valued at $40 for the Grande Premiere 2012 Fashion Show. 2 tickets each valued at $40 for the Grande Premiere 2012 Fashion Show. $150 Gift Certificate to redeem for a 5 day summer Safety Camp with the Ottawa Safety Council Recommended for ages 4-8. Expires end August 2012. Can not be redeemed for cash. $50 gift certificate towards a specialty cake order with Sugarcraft Specialty Cakes. Expires 31st July 2012. $50.00 gift certificate to Sixo active wear annual factory outlet sale. Free Birthday Party for 1.5 hours at Tiny Hoppers premises. Choose your theme and have our birthday party coordinators keep the parties goers entertained. Total value: $150. Free Birthday Party at Tiny Hoppers premises. Choose your theme and have our birthday party coordinators keep the parties goers busy entertained. Plus a Gift basket with Bath toys, Make & Paint Frogs, foam shapes etc. Total value: $200. Car rental for a weekend. Approx Value before taxes $120.00. $400 - Silver Plan Snowblowing Package - Basic service from November 15th and ends once we reach 250 cm of total accumulation or April 15th, whichever occurs first. Includes snowblowing for snowfalls of 5 cm or more, 1 revisit within 24 hours of storm ending to remove any plow ridges left by the city plow. * Snow services are offered from Orleans through Parkdale Avenue, the river to Walkley Road. Tractor Blowers service the Orleans, Blackburn and Pineview area. We dressed our pumpkin in Scottish attire and named him Hamish. In addition, inside the sporran are: a certificate for an acrylic kilt (limited tartans available) including belt with buckle and regular sporran. 2 x Tickets to Scotland Tonight with the Son's of Scotland Pipe Band - November 20 at 2:00pm,The Bronson Centre. 2x 10% off coupons for Silpada Designs Jewellery. Total value: $150. Complimentary Winter Maintenance Package (brake inspection, tire rotation and oil change) value $61 at Speedy Muffler, Brake and Wheel, 963 St.Laurent. Tweezers Unisex Hair Design and their pumpkin The Staff of Tweezers has donated a $100 prize package Including: Senscience Shine Spray, Senscience Pomade, Senscience Styling Cream, Styling Brush, $40.00 gift certificate. Molly Maid Cleaning Services Gift Certificate for $100. Not for use in Quebec - Ontario only. Special T Travel package for Florida, and Mexico that can be taken as separate trips or combined:- 4 Days/ 3 nights Orlando* , 3 Days/2 nights Daytona*,4 Days/3 nights Cruise to Bahamas and Hotel stay, 3 Day/2 night Mini Vacation from a choice of 21 Destinations, 7 Day Car Rental or 2 x adult one day theme Park tickets i.e. Disney or Universal etc. Orlando Magic Card providing discount at Restaurants etc. Bonus Trip of 5 days/4 nights Cancun, Mexico. *Mandatory 90 minute tour of facility. Expiry Date: April 2012. Total value: $500.